The Avia B.35 (RLM designation Av-35) was a fighter aircraft built in Czechoslovakia shortly before World War II. It was designed to meet a 1935 requirement by the Czechoslovakian Air Force for a replacement for their B.534 fighter biplanes. The B.35 was an elegant, low-wing monoplane with a graceful elliptical wing. The fuselage was constructed from welded steel tube, covered in metal ahead of the cockpit and fabric aft, while the wing was of entirely wooden construction. Rather anachronistically, the Air Force specified fixed tailwheel undercarriage for the aircraft, in the hope that this would speed development. 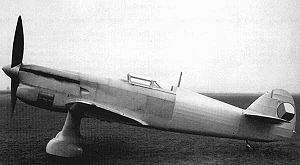 The first prototype, the B.35/1 displayed excellent flying characteristics and high speed and was originally powered by a Hispano-Suiza 12Ydrs piston engine. The powerplant was later changed to a Ycrs with identical power output, but with provision for an autocannon to be fitted between the cylinder banks to fire through the propeller hub. Testing continued until 22 November 1938, when the aircraft was destroyed in a crash that killed Avia test pilot Arno�t Kavalec. Nevertheless, a second prototype was already reaching completion, and was fitted with redesigned ailerons and flaps. It first flew on 30 December with testing beginning in earnest in February 1939. A pre-production series of ten aircraft was ordered, but before these could be built, Czechoslovakia was occupied by Germany in March. Bx�l�, Miroslav. Avia B-35/B-135 (in Czech/English). Praha, Czech Republic: MBI, 2003. ISBN 80-86524-03-5. Green, William. War Planes of the Second World War, Fighters, Volume One. London: Macdonald & Co.(Publishers) Ltd., 1960. ISBN 0-356-01445-2. Taylor, Michael J. H. Jane's Encyclopedia of Aviation. London: Studio Editions, 1989.